Waterloo – A team of students from Wilfrid Laurier University’s Lazaridis School of Business and Economics won the Bank of Canada’s third annual Governor’s Challenge, a national competition in which students take on the role of policy advisors who recommend what the Bank’s key interest rate should be. This is the third year a Laurier team has made the final but the first year it has won. Twenty-five teams from across Canada entered this year with more than 100 students participating. Five teams were selected as finalists. Laurier is one of only two universities to have made the finals all three years of the competition. 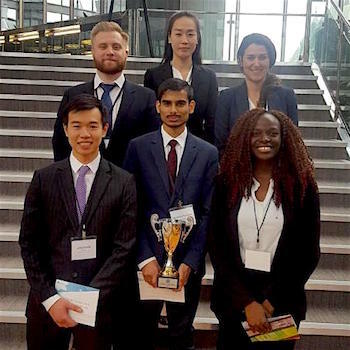 The Laurier team formed in September, consisting of fourth-year students Marieh Ghafari Rahbar, Salman-Hussein Hasham, Filip Lup, Joan Oginni, Jonathan Szeto and Kristine Zhang. The students immediately began identifying and analyzing current macroeconomic trends in Canada. They ultimately had to make a policy recommendation to keep inflation stable at the target of two per cent by raising the key interest rate, lowering it or keeping it unchanged. The competition is composed of two rounds. The first round involved a 15-minute team presentation and question-and-answer session by videoconference in November. The finalists’ round took place in Ottawa on February 10 and involved a presentation and a question-and-answer session in front of a panel of distinguished judges, including a member of the Bank of Canada’s Governing Council. Bank of Canada Governor Stephen S. Poloz was also in the room observing all the finalists’ presentations. Because the competition uses real, current economic data, the team had to redo all its time-consuming analysis between the first and final round to take the latest trends and events into account. The students’ “Plan A” recommendation is for the Bank of Canada to raise the key interest rate by 25 basis points in the third quarter of 2018, which would bring the interest rate from the current 1.25 per cent to 1.5 per cent. The Laurier team also recommended hiking the rate by a further 25 basis points in the second quarter of 2019. This recommendation assumes the economy will stay strong, which the students forecast as the most likely scenario. The team also took different risk scenarios into account, including a stock market crash, a housing market crash, North American Free Trade Agreement (NAFTA) negotiations collapsing, and the U.S. economy performing better than expected, to produce various “Plan B” policy recommendations about which they were extensively quizzed. The students credited Pang and Shiamptanis for their skilled guidance.